In an era where things have limited life spans and are made to be thrown away, it is our intention to produce works which will last for generations and have lasting value. 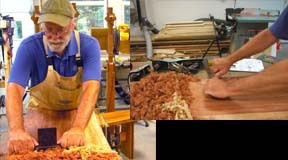 Whiskey Creek Wood Works designs and makes many pieces for specific client requirements as well as other available items. We create lamps, small chests, small boxes, large boxes, instrument cases, and tables. We can design to fit your needs. 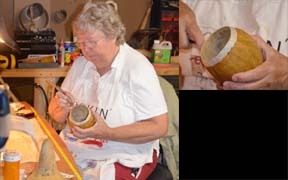 Gourds have been used and decorated by many cultures for centuries. It is rewarding to be part of this rich history and tradition and at the same time be free to take the decorating in any direction I choose.